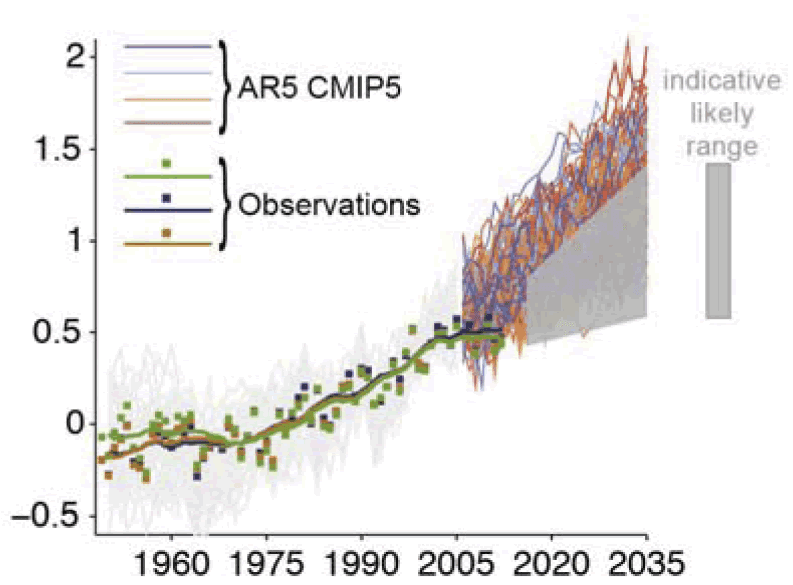 Science deniers have resorted to once again using a flawed discarded chart from an earlier draft of the AR5 IPCC report. This time to consider the new paper by Cowtan and Way, which I've already written about here. The denialati didn't have to use a flawed, discarded chart. Though it's kind of cute that they've finally found something produced by the IPCC which they like. Most of the time science deniers reject everything from the IPCC but when it comes to something the IPCC has rejected, they suddenly decide they'll embrace it. Which discarded IPCC chart do science deniers hang onto so tenaciously? 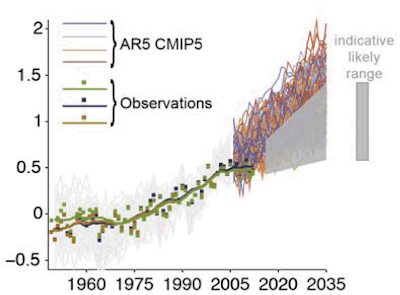 No, it's not the discarded chart showing short term projections (to 2015) for "Estimated changes in the observed globally and annually averaged surface temperature (in °C) since 1990 compared with the range of projections from the previous IPCC assessments". It's the discarded IPCC chart showing short term projections (to 2015) for which "the focus is now on the range of selected scenario projections from AR4". 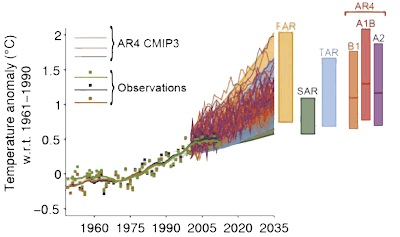 Not only do the deniers want to use a discarded chart, they want to use a discarded chart that uses older AR4 CMIP3 models (see below), not the discarded chart using CMIP5 models used by AR5. One thing though, it looks as if some of the deniers have accepted some actual climate science. Anthony Watts and Stephen McIntyre seem to have accepted Cowtan and Way. It not all roses though. Some of the science deniers reject what their chosen discarded chart purports to represent. (I hope you're still able to follow the denier trail heading down their convoluted topsy turvey denier pathway. )The chart itself has grey shading (see below) that depicts the "90% uncertainty estimate due to observational uncertainty and internal variability based on the HadCRUT4 temperature data for 1951-1980". Well, first of all the fake sceptics are using a flawed chart to misrepresent the data. Secondly, it's not "outside" the 90% envelope even on the flawed chart. Oh boy! They really are a sad desperate bunch of scallywags, aren't they. That there are continuing defects in HadCRU methodology should hardly come as a surprise to CA readers. It reads like a denier interpretation, emphasising the words "continuing defects". It's true that HadCRUT still doesn't provide for the Arctic properly. Cowtan and Way call it a "bias" in their abstract. It's acknowledged by scientists that HadCRUT is biased because of the way HadCRUT is constructed. Because of the gaps in the coverage particularly in the Arctic. 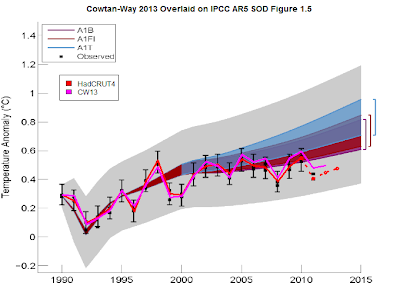 The fact that Cowtan and Way used a hybrid of different temperature sources shows that their method is not straightforward and I don't expect it would be easy to incorporate all the measures they used into a monthly update of HadCRUT. Hopefully a reader will shed more light on that. Attempts to reconcile and/or explain discrepancies between HadCRU and GISS also seem worthwhile to me. I would not accept any praise coming from The Auditor. It's not worth a brass razoo. I'd only accept praise from scientists who specialise in studying the global surface temperature anomaly. And there's plenty of praise to go around for Cowtan and Way from scientific sources without having to take any notice of the denialati. In any case, Cowtan and Way didn't do the work to reconcile or explain discrepancies between HadCRUT and GISTemp. The reason they did the work was to fill in the gaps in global surface temperature coverage. The results are what they are. ...Dr. Cowtan is an interdisciplinary computational scientist who recognized some potential solutions to this temperature coverage gap problem. And the result was that the rate of increase in surface temperature between 1997 and 2012 turns out to be greater than that depicted by both HadCRUT4 and GISTemp. Below are a few of the comments from Anthony Watts WUWT article (archived here). Although Stephen McIntyre seems to accept the findings, most of Anthony Watts' WUWT rabble can't bring themselves to do so. Pity the polar data, tortured into an inadequate confession. After all, greenhouse theory says the tropical troposphere is supposed to warm first and fastest. What happened to all the heat that was hiding deep in the oceans? How did it suddenly migrate to the Arctic – retrospectively too, apparently. Clearly this is groundbreaking new scientific theory! So one man’s BS doesn’t match another’s? Its starting to look like the data sets are all fake religions. My post will hopefully be finished tomorrow and I’ll explain why that’s odd…among other things the warmistas have overlooked. ROM says he's gone and made a fool of himself at Lucia's blog, apparently not realising that the Cowtan and Way analysis is from 1979 to 2012. Nor does he understand that the purpose of the study was not to come to a predefined outcome. It was done to fill in the gaps in the coverage. The findings were what they were. You'll see that ROM equates discovering new knowledge with being raped. What a nutter! As a humble member of the public who is expected to pay for most of this climate science research guff and who as a member of that low life uninformed public who are expected to lay down and be data raped by every passing wannabe climate scientist, it seems to me that the finangling [ I could use some quite unprintable language to describe this ] of the data where no data exists to get a result that ensures that what is seen to be happening in the climate, isn’t according to the non existent data. In this case attempting to dispel the idea that there is a “Pause” in the warming using some fancy and argued about statistical techniques applied to that non existent data taken from a region where there are almost no records to justify the claim there isn’t a Pause of over 16 years running in the climb in global temperatures. So why is it that this particular statistical lash-up couldn’t also be applied to those 20 years of supposed increasing temperatures from 1978 to 2007, a period which is only 4 years longer than the Pause and on which 20 years the entire global warming meme / ideology is based. Using Cowtan & Way’s statistical techniques and the same identical data base of temperatures it could probably be proven that there was no increase in global temperatures during that 20 years of supposed warming. The models aren’t based upon either physics or observations. They’re based upon GIGO assumptions not in evidence, indeed contrary to all actual observations & physical evidence. Dumb Scientist does a terrific job of informing the denialati and responding to their questions at WUWT, copping a fair bit of flak in the process (archived here). Thanks again Sou. The flak's no big deal. Apparently I'm on the corrupt climate gravy train, so I can afford flak jackets with the grant money I grudgingly choose not to roll around in like Scrooge McDuck. We [RSS] do not provide monthly means poleward of 82.5 degrees (or south of 70S for TLT) due to difficulties in merging measurements in these regions. In contrast to the RSS coverage of 70S to 82.5N, UAH TLT data coverage is from 85S to 85N. The two reconstructions diverge in ~2005, with RSS running a little cool relative to UAH. Is this the effect of increasing polar amplification (especially Arctic) exacerbated by the difference in polar coverage between the two TLT data sets? If so, it supports C&W13. It's worth bearing in mind that the satellite TLT reconstructions may both be biased cool. See here at Hot Whopper and here at SkS. I would argue that HadCRUT should not use the hybrid method using UAH data for their standard product because it only works in the satellite period. And it should also be investigated in much more detail before you would use it for an operational dataset that is used by many researchers. The interpolation using kriging is likely a good idea for all data.